The leaves are used as an expectorant and to treat certain cancers. The flowers are used to make an antobiotic wash to treat wounds and infections. Leaves, stems, flowers and seeds are edible raw or cooked. The plant also yields a red dye used in fingernail paint. 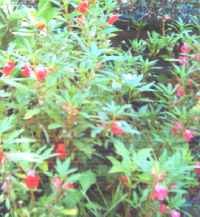 The plants are upright, bear large snapdragon-like blooms from June to frost and have been a favorite garden flower for hundreds of years. It is called 'snapweed' because of the ripe seed pods which pop open at a touch. Repays even the harshest conditions with a bright array of color through flood, drought or damage. The plants prefer a well-drained soil in a full sun or partially shaded location and grow to a height of 3ft.